Los Santos Learning Centers is a group of community-developed, non-profit education centers. Each community center was developed and is run by local community members. The centers provide English as a Foreign Language classes to students of all ages.The learning centers are located in the Zona de Los Santos, a mountainous region two hours south of San José. VOLUNTEER POSITIONS: All positions are volunteer English teaching positions. Volunteers teach approximately 15-20 hours per week and are responsible for planning their own lessons. Volunteers should have experience teaching EFL/ESL or another subject, an EFL/ESL certification, and/or a degree in education. Volunteers receive free room and board in the home of a local family. Room and board includes housing, three meals per day, and basic amenities such as laundry. Because we are a community-based, non-profit entity, we cannot provide a salary or stipend for our volunteers. Living with a local family provides volunteers an opportunity to become part of the local community, experience Costa Rican daily customs and lifestyles, learn Spanish, and participate in a cultural exchange. While your primary role will be teaching English, you will also have the opportunity to develop other projects. In the past, our volunteers have built community gardens, taught dance classes, and formed a children's choir. LOCATION: Our communities are located in the beautiful Zona de Los Santos, Costa Rica, about two hours south from San Jose (the capitol) in the heart of the coffee growing region of Costa Rica. We are surrounded by beautiful mountains, national forest reserves, and some of the best bird-watching in the world. WHEN: We are interviewing candidates on a rolling basis. We ask that all volunteers commit to a minimum of three months, but volunteers available for longer stays (6 months or more) are highly preferred and will be given preference. We are currently looking for a number of volunteers to start during the week of May 23, 2016. * Some knowledge of Spanish. * Undergraduate or graduate degree in education (or related) and/or ESL/EFL certification and/or 1 year-plus experience lesson planning and teaching English. * Experience teaching and working with children or teenagers. * Willingness to integrate with the local community and live with a local host family. * Must be resourceful, flexible and independent (both in working and living arrangements). * Commitment to service and volunteerism. * Should be computer savvy, able to use the internet, Facebook, etc. VOLUNTEERING: Because we are community-based, there is no fee to volunteer with us nor can we offer a salary or health insurance. * Lodging and 3 meals per day in the home of a local family. Accommodations include a private room and laundry facilities. * Ongoing support from the learning centers' board members and a native English speaking director to help meet your needs and resolve any challenges that may arise. * Transportation from Juan Santamaría airport or your current location in Costa Rica to the community. * The volunteer is responsible for his/her flight in and out of Costa Rica for the duration of his/her stay. 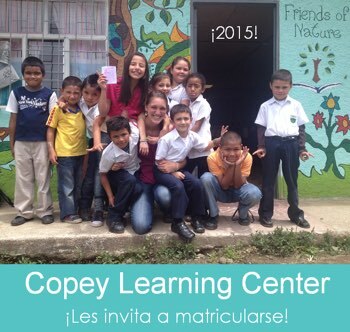 TO APPLY: Email info@copeylearningcenter.org with your resume, cover letter, and two references.